Published Mar 4, 2015 by Addison-Wesley Professional. Part of the LiveLessons series. Learn how to build cross-platform apps for iOS, Android and Windows Phone in C# using a single code base from the comfort of your own Visual Studio with this video training course from Chris Sells. This course will show you how to build a real-world mobile app targeting iOS, Android and Windows Phone using Xamarin 3 integrated with Visual Studio. Gone are the days when you could target Windows and hit the majority of your potential users, especially for consumer apps. Now, with the release of Xamarin 3, it’s possible to build your entire app in a way that’s shared between iOS, Android and Windows Phone. For the first time, you can share the entire code base of an app between the three platforms, not just some libraries. 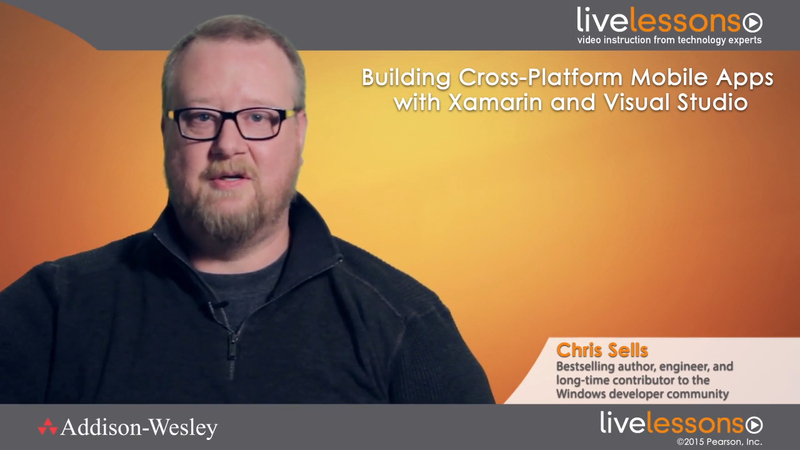 Building Cross-Platform Mobile Apps with Xamarin and Visual Studio LiveLessons is a hands-on course that takes you through an entire app end-to-end, including inception, design, implementation, device-specific debugging, packaging, deployment, monitoring and maintenance. LiveLessons Video Training series publishes hundreds of hands-on, expert-led video tutorials covering a wide selection of technology topics designed to teach you the skills you need to succeed. This professional and personal technology video series features world-leading author instructors published by your trusted technology brands: Addison-Wesley, Cisco Press, VMware Press, IBM Press, Pearson IT Certification, Prentice Hall, Sams, and Que. Topics include: IT Certification, Programming, Web Development, Mobile Development, Home & Office Technologies, Business & Management, and more. View all LiveLessons at http://www.informit.com/livelessons.